WASHINGTON, DC—Coordination of contractors, continuous monitoring and more rigorous inspection are among the requirements of the first new federal rule for confined-space work in construction. 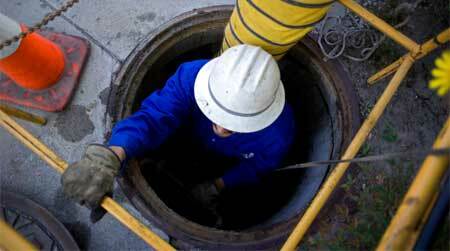 The Occupational Safety and Health Administration announced a final rule Monday (May 4) on Confined Spaces in Construction to protect workers in tanks, sewers, attics, boilers, pits, manholes, crawl spaces and other tight areas not intended for continuous occupancy. The rule, which takes effect Aug. 3, 2015, has been in the works for 35 years. OSHA issued the first advanced notice of proposed rulemaking in March 1980. 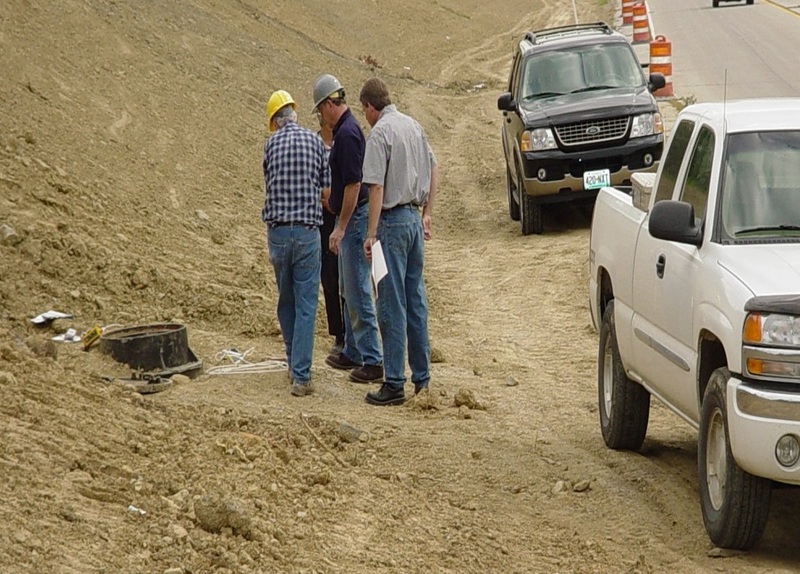 An OSHA presentation, "Silent Killer in a Newly Constructed Manhole," details a fatality Aug. 5, 2004, in a new sewer system under construction. The victim was found at the bottom of the manhole. The agency has had a rule on permit-required confined spaces in General Industry since 1993, but the rule exempted construction and shipyards. 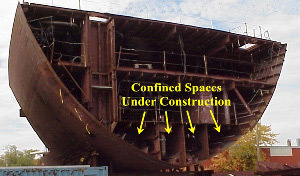 The agency issued a shipyard directive for confined-space work in 2011. Meanwhile, the only requirement for confined spaces in construction has been training. OSHA "concluded this was inadequate as injuries and fatalities continued to occur," the agency said. The new rule will protect nearly 800 construction workers a year from death or serious injury, said OSHA. The measure matches protections already in place for decades in manufacturing and general industry, with some new provisions tailored to the construction industry. Chief among them: a requirement that multiple employers share safety information and continuously monitor hazards. 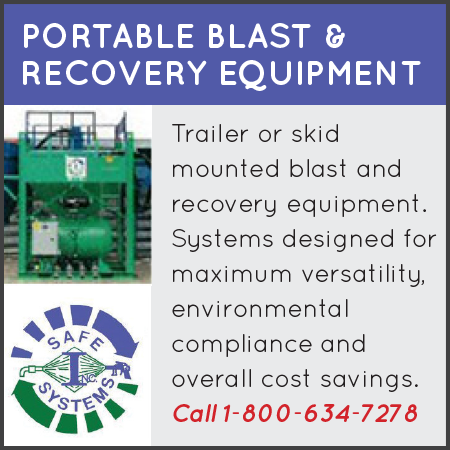 That provision is designed to prevent, for example, one subcontractor from running a generator near the entrance of a confined space where another trade is working, inadvertently causing a building of carbon monoxide in the space. 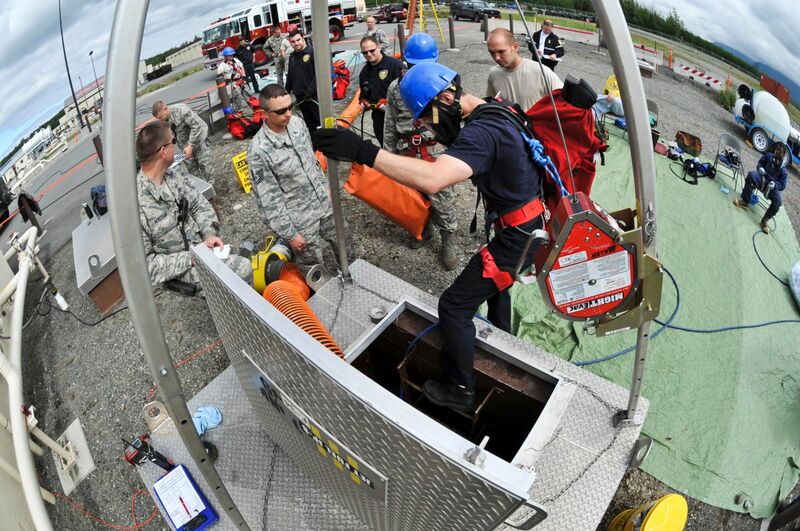 Blayne Ross, a firefighter with Joint Base Elmendorf-Richardson in Alaska, readies himself to be lowered into an underground jet fuel tank in a confined-space entry rescue drill. OSHA's new construction rule includes new mandates for rescue. "Unlike most general industry worksites, construction sites are continually evolving, with the number and characteristics of confined spaces changing as work progresses. "This rule emphasizes training, continuous worksite evaluation and communication requirements to further protect workers’ safety and health." "This rule will save lives of construction workers," said Dr. David Michaels, the OSHA administrator. The new rule has five key differences from the general-industry rule and clarifies several existing requirements. In general, the rule requires employers to determine what kinds of spaces their workers are in, what hazards could be there, how those hazards should be made safe, what training workers should receive, and how to rescue those workers if anything goes wrong. 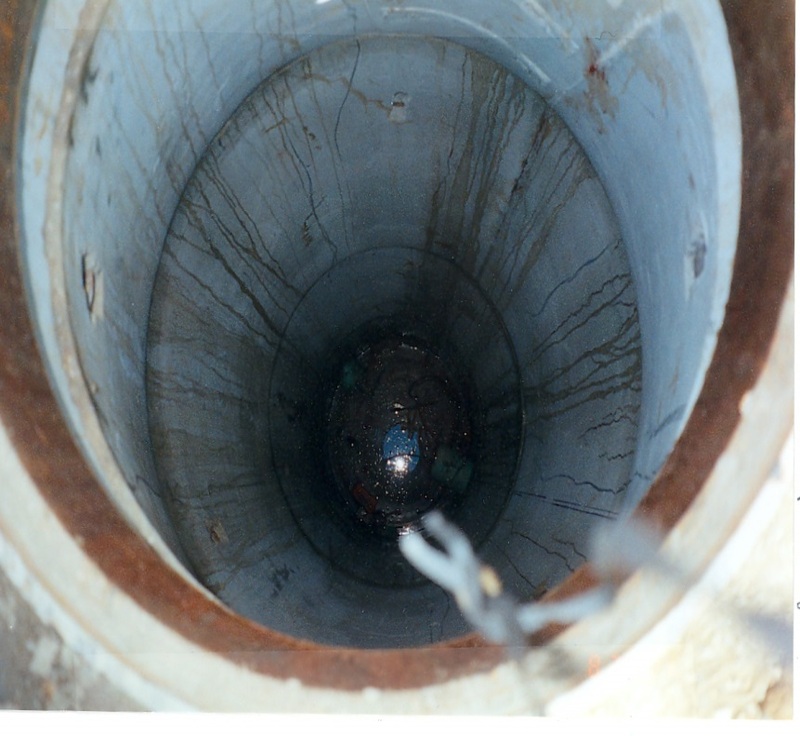 Confined spaces are those with limited entry unintended for longterm occupancy. They include tanks, crawl spaces, sewer systems and attics. Allows for the suspension, rather than cancellation, of a permit if the entry conditions on the permit change or an unexpected event requires evacuation of the space. The new requirements for coordination of multiple employers make the controlling contractor, rather than the host employer, the primary point of contact for information about permit spaces at the work site. 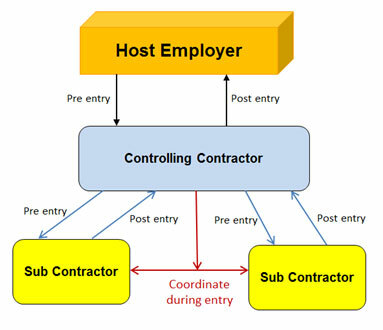 The host employer must provide any information about permit spaces at the site to the controlling contractor, who then passes it on to the so-called "entry employers"—those whose employees actually enter the spaces. The host is also responsible for making sure that employers outside the space are aware of the work inside. Entry employers, in turn, must inform the controlling contractor about their entry program and about any hazards they encounter. The controlling employer must pass the information back to the host and to other entry employers. The new rule details responsibilities and communications flow among multiple contractors on a single worksite. The new engulfment monitoring requirement envisions protection against, for example, upstream flash flooding that could endanger workers in a storm sewer. An electronic sensor or observer posted upstream from the work site could alert sewer workers at the first sign of a hazard, OSHA said. The permit suspension option requires that the space be returned to the permitted entry conditions before re-entry. To provide training in a language and vocabulary that the worker understand. By improving rescue services, OSHA hopes to reduce a common cause of death in a confined space: one worker rushing into a dangerous space to rescue another. The rule also defines several terms such as "entry employer" and "entry rescue." OSHA issued a confined-space standard in 1993, but exempted construction. A shipyard directive was released in 2011. The construction rule has been 35 years in the making. OSHA has also introduced new fact sheets on confined-space construction safety in crawl spaces and attics, pits and sewer systems. Employers who are engaged in construction work, such as building a new structure or upgrading an old one, must follow the new confined-space rule for construction. The construction rule requires a written confined-space program if workers will be entering these spaces and restricts entry to workers who have been assigned to, and trained for, work in that space. Employers whose workers are engaged in both construction and general industry work in confined spaces will meet the requirements of both by following the construction rule. The 27 OSHA-approved State Plans must enforce standards that are at least as stringent as federal OSHA's, but individual requirements may be different or even more stringent. Employers should check with their state plan for additional information. 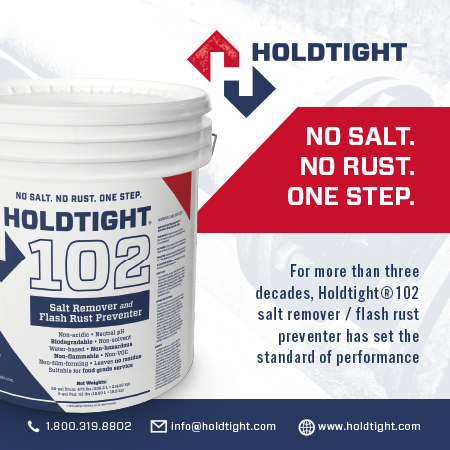 For more information about the rule or compliance, visit OSHA's Confined Spaces page or contact Directorate of Construction, Room N3468, OSHA, U.S. Department of Labor, 200 Constitution Avenue NW, Washington, DC 20210. 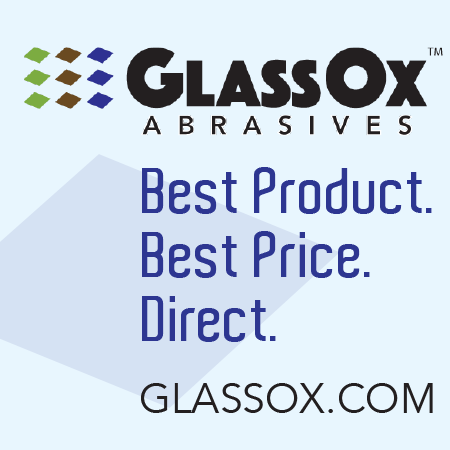 Phone (202) 693-2020 or fax (202) 693-1689. The road to the rule has been exceptionally long. OSHA's new construction rule requires a written confined-space program if workers will be entering these spaces and restricts entry to workers who have been assigned to, and trained for, such work. After OSHA signaled its intention in 1980 to make the rule, it took 13 years for the agency to issue a standard—and that rule exempted the construction industry. The United Steel Workers responded to the 1993 standard with a lawsuit demanding that the construction industry be included. OSHA agreed to work on a measure. After seven years, stakeholder meetings for the construction measure were held in 2000. A Notice of Proposed Rulemaking came in 2003. In 2004, small business weighed in on the idea. The actual rule was finally proposed in 2007, and public hearings were held in 2008. There, the issue stalled, until now. In 2011, Public Citizen estimated that the rule could have saved 189 lives and prevented nearly 19,000 injuries had it been issued in 1980.